Nestled at the edge of Brussels’ Green Belt and surrounded by deep woods lies our comfortable and luxurious bed & breakfast accommodation. Brussels, Leuven and Wavre are all within easy reach and we are just 20 minutes drive from Brussels Airport, making In Between an ideal choice for the discerning International business traveller. In Between is also perfectly situated for the outdoor enthusiast with many fantastic hiking and mountain bike trails to be found locally. A modern, newly built house In Between has two non-smoking guest rooms each equipped with ensuite bathroom plus private terrace with superb unspoiled vistas overlooking the “Lasne” valley. Wake up to a rich and varied breakfast served in the spacious lounge. After a walk in the forest or a bike ride why not try our sauna, the perfect place to relax, unwind and soothe those aching limbs. In Between offers secure bike storage, facilities to dry muddy boots and wet outdoor clothing and covered car parking with direct access to guest rooms via an elevator. 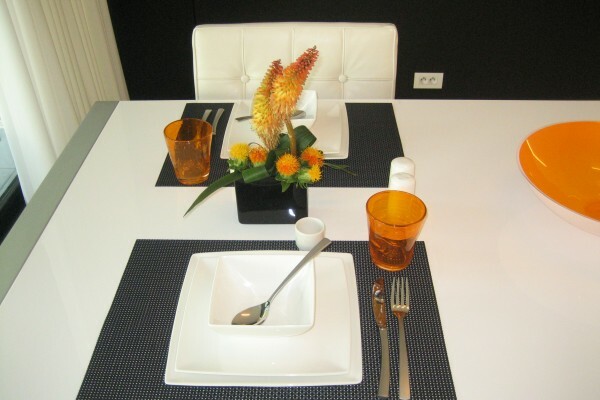 2 rooms: "Leuven" and "Wavre"
Rich and various breakfast included. Did you stay in In Between? Let us know what you thought about it and help others to make the right choice! * I confirm having stayed in In Between. Find other bed & breakfasts in Sint-Agatha-Rode, all bed & breakfasts in Groene Gordel or all bed & breakfasts in Flemish Brabant.